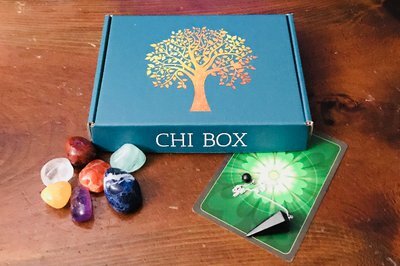 Enter your email address below to receive a notification when Chi Box starts accepting new sign-ups! Enter your email address below to receive a notification when Chi Box is accepting new sign-ups again. All Chi Boxes will be shipped by the 7th of each month. Make sure to place your order 2 days prior to the end of the previous month to guarantee you receive your order for that month! Chi Box is a linear box designed to help you with your personal spiritual growth. 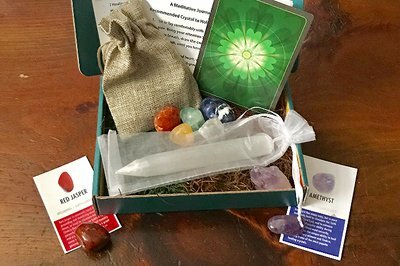 Each box is Reiki-charged and contains intuitively selected goodies such as healing crystals, tarot card, natural herbs, and more! Discover your potential in Crystal Healing, Chakra balancing, Past Life Regression, Connecting with your Spirit Guides, and More! Guided Meditations, Affirmations, and Spiritual Exercises Monthly! Intuitively selected Tarot, Oracle, Fairy, Angel, or Archangel Card included each month. All Boxes are assembled by professional spiritual practitioners trained in various Metaphysical Arts and Modalities. The box is very interesting and I really did like all the information within the first few boxes but as the months went on the quality and quantity dropped and there is no way it was worth it. This last box was complete trash. All the stones were something I could have went outside and found. It kind of pissed me off and I refuse to have it renewed. This was a subscription for my niece and she absolutely loved it!! !